At $649, the Epson Home Cinema 1060 delivers more than enough to make it a solid value, starting with the fact that it is the brightest of all projectors in our eight model sub-$700 roundup. Several models offer higher ratings without delivering what they promise. The HC 1060 overdelivers with a whopping 3300 lumens, exceeding its 3100 lumen rating. It is also by far the brightest with video optimized settings, at over 2500 lumens. 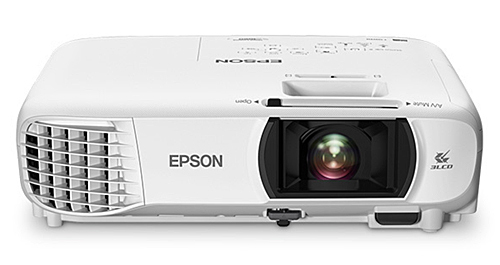 Beyond the Epson 1060's muscular light output, it lights up a screen with the best uniformity of any projector in the shootout at 79%. It is the only projector that can read files from a USB key, and the only one with built-in Wi-Fi for easy connection to a phone or tablet. The HC 1060 doesn't support 3D and it scores lowest in the group for black level and contrast, which limits its usefulness for traditional home theater. However, its high brightness makes it a top choice for ambient light use, where lumen power is far more important than black level. This is a Super Bowl party projector, great for a backyard movie nights, and in general any large screen application where ambient light is desired or expected. Low Lamp Mode. Eco mode reduces brightness by 38% compared with Normal mode. Video Optimized lumens. For film and video, Bright Cinema mode delivers a close color match to a reference projector after a little tweaking. The measured 2,533 lumens is enough with a 1.0 gain screen for a 16:9 image as large as 230" diagonal in a dark room or 145" with moderate ambient light. With a 1.3 gain screen, it is enough for a gigantic 260" image in a dark room or a 165" image with ambient light. Video Performance. The HC 1060 is the only projector in this roundup that delivers color within a realistic range for film and video with default settings in all color modes. Like the brightest mode in most projectors, Dynamic has a green bias, but its so slight that without a reference image for comparison, there are few-to-no clues to indicate that it is off at all. So not only does it generate 3300 lumens, it does so without the heavy green bias that is typical of most of its competitors. Due to its emphasis on maximum light output, the HC 1060 doesn't deliver as dark a black level as any of the DLP models in this roundup. So in a dark viewing room, that leaves shadow detail, contrast, color vibrancy, and sense of depth in last place for this group. The brighter the room, however, the more the advantage shifts to the HC 1060. Ambient light tends to wash out darker areas and shadow detail with any projector. So when the lights are on, the HC 1060's high brightness stands up to the light to give the image more saturated color than the DLP models in ambient light and a greater feeling of depth. Zoom Lens Effect on Brightness. The 1.2x zoom isn't enough to curtail light noticeably at the telephoto end of the range, so there's no need to take the lens setting into account when choosing a position for setup. Brightness Uniformity. At 79% brightness uniformity, the HC 1060 offers the most uniform brightness for any projector in this roundup. The variation is barely enough to see with a solid white image. Input Lag. The input lag for the HC 1060 is 52 ms with all color modes and all settings. For serious gamers, that's a disadvantage for games that depend on reaction time. On-board Audio. Having tested one unit for an earlier review, and two units for this roundup, we can report that the volume from the onboard 2W mono speaker varies from unit to unit. However, the volume for all three was higher than for some of the projectors in this roundup with 10W speakers. The range runs from filling a small to mid-size room on the low side to filling a mid to large-size room on the high side. Sound quality varies as well, but was good enough to be usable for all three units. Fan noise. As is probably inevitable for the brightest projector in this roundup, the HC 1060 gets the lowest score for fan noise. As with more than half of the projectors in this group, the fan noise in full power mode is easy to notice in quiet moments in a room with ambient noise. But it is the only one that's also loud enough to likely notice in Eco mode during quiet moments. However, there is an important mitigating factor -- the HC 1060 in Eco mode is quieter than the full power mode for most of the projectors in this roundup. In addition, comparing video optimized settings for all the projectors, it is also brighter in Eco mode than any of the competition in full power mode. So with video optimized settings across the board, the HC 1060 can be quieter than most of the competition and still be the brightest in the group. High Altitude mode is typical for all the models in this roundup. It is loud enough in both Bright and Eco modes to be potentially intrusive in quiet moments even in a room with ambient noise. Throw distance. The throw distance for a 120" diagonal, 16:9 image with the HC 1060's 1.2x zoom lens ranges from 8.8 to 10.7 feet. For a 150" image, it is 11.1 to 13.4 feet. 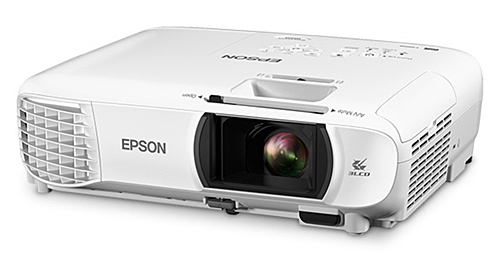 You can find the throw distance range for the image size you want by using the Epson Home Cinema 1060 Projection Calculator. Lens offset. The 1060 has an unusual throw angle compared to the competition. With the projector sitting on flat surface, the bottom edge of the image is 6% of the image height below the centerline of the lens. The HC 1060's lens offset makes it well suited for placing on a shelf behind the seating area, but if placed in this manner you would be sitting fairly close to the screen--about 1.2x the screen width or closer. For some this is ideal, and for others who would prefer to sit back farther, the geometry is a limiting factor. The relatively low throw angle makes the HC 1060 poorly suited for sitting on a table or low shelf, as you would likely have to tilt it up to hit the screen, and then adjust keystone, which can add artifacts to images with fine detail. If you prefer using a ceiling mount, you may need an extension to drop the projector far enough from the ceiling to avoid having to tilt it. The Epson Home Cinema 1060 stands out as unique in many key ways in this eight-way shootout. It is an excellent value at $649. It is the only projector in this sub-$700 roundup with built-in Wi-Fi for easy connection to a phone or tablet and the only one that can read files from a USB memory key. It is also the brightest by far, both for video optimized settings and for the brightest setting with colors that fall within a realistic range. The HC 1060 also scores well on most other aspects of image quality. It maintained crisp focus edge to edge on our fine detail test images; it can't show rainbow artifacts; and its 79% brightness uniformity is the best for any projector in this roundup. The high brightness will let you have a much larger image for traditional home theater than any of its competition. However, that's not the best use for the HC 1060, since it doesn't deliver the dark blacks and contrast in a dark viewing room that you'll get with the DLP models. Similarly, you can use it for gaming, but its input lag--52 ms--is enough to be an issue for games where reaction time matters. And it doesn't support 3D. Where the Epson Home Cinema 1060 shines is for use in ambient light--in a family room or for a backyard movie night. With ambient light, other projectors lose the advantages they have in the dark, while the HC 1060's extra brightness gives it vibrant, saturated color and better three-dimensionality. Even with video optimized settings, it is bright enough for 165" image in moderate ambient light with a 1.3 gain screen. If you match it with an Ambient Light Rejection screen it can give you a dynamic, vibrant, high contrast 120" TV for ideal use in a family room. So while the Epson Home Cinema 1060 is not a great choice for classic dark home theater or for video gaming, it is one of our top picks for a family room TV substitute and for moving from room to room or to the backyard for a movie night. 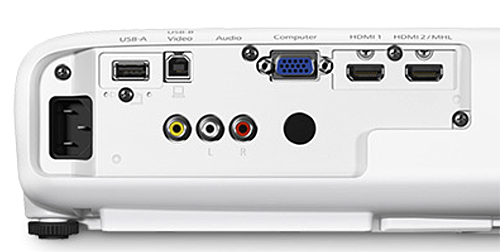 Can I use the WiFi to connect a PC and view movies without HDMI? PC is already connected to home theater and TV at the othert side of the room, so this option would simplify installation. Any issues with this? You would be best to read the manual on this (link below), but it would appear you can do this with Epson's software for PC or Android/iOS mobile devices.